1. Cut back on the other unhealthy options such as juice and soda. 2. Have them pick out a special water bottle that will be used only for water. It doesn't have to be pricey, just something they are really excited about using. 3. Try garnishing with fresh citrus to add flavor- such as lime, lemon, orange and add ice! 4. Make sure that water is easily accessible. 5. Set a good example and drink plenty of water yourself. If you have tips to share, we'd love to hear them! Chia Seeds For Kids? Yep! We all remember the commercials for chia pets in the '80s, well chia seeds, (consumed by the Aztecs for their nutrients), are making their way in mainstream supermarkets as the new superfood and we're here to tell you what all the fuss is about. Richer in omega-3 fatty acids than salmon, chia seeds are filled with antioxidants, protein, calcium and fiber. One tablespoon packs a big nutritional punch and we are always on the look out for that! So what do chia seeds taste like and will kids eat them? Think flavorless poppyseed, which is pretty awesome because they add a fantastic texture without altering the flavor. When wet, and soaked for some time the seed takes on a gelatinous texture, reminisant of tapioca. And yes, totally kid approved! They were a big hit when tossed into a smoothie or mixed into yogurt. 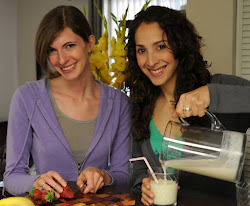 In the smoothie it becomes untraceable, but in the yogurt it brings a divine texture! Try it with your kids and let us know what they think. So far, big thumbs up over here.